Want to learn about Belize before you make your plans? Follow our blog! The top 10 tours to do in Belize! If you’re wondering, the Fun Tours Team has done them all! 2) Belize Cave Tubing, Zipline and Xunantunich Maya Ruins Tour – This tour made the list for being the most fun packed tour at the best cost ever. This tour is available for guests from Ambergris Caye, Caye Caulker, Belize City and San Ignacio. 3) Lamanai ( Submerged Crocodile) – When the Spanish came to the area, they met people inhabiting the area at Lamanai. Most of Mesoamerica was already lying in ruins waiting to be rediscovered. 6) Altun Ha and Community Baboon Sanctuary – Don’t be confused by the name, the sanctuary is actually home to the Howler Monkeys. This is one of the best Family tours especially if you bring your kids along. 7) Belize Cave Tubing and Zipline tour – Tours to the Nohoch Che’en Archaeological Reserve started with this tour and after 20 years it is still the number one tour in Belize and the number one tour for cruise guests on a Western Caribbean cruise. 8) Tikal, Peten Guatemala – What many guests visiting Belize don’t realize is that its possible to visit the city of Tikal whilst on vacation in Belize. Designated a UNESCO World Heritage sit. This tour should be a must for any traveler coming to Belize especially if you will be in Belize longer than a week. 1 day tours as well as vacation package options available. 9) Horseback riding and the Belize Zoo. – Talk about an amazing nature tour, ride trails in amazing dense forests seeing the flora and fauna of Belize. 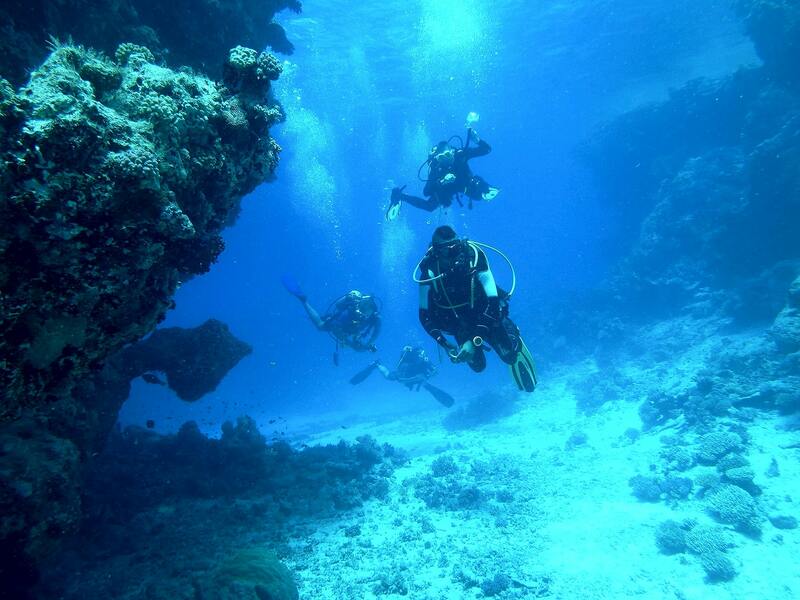 Belize Scuba Diving, why Ambergris Caye is a great place to hub from! With the breaking waves signifying the reef crest of Belize’s coastal treasure, the world’s 2nd largest barrier reef, clearly visible from its’ sandy shores it is only understandable that the thriving offshore waters of Ambergris Caye would provide some of the country’s most spectacular and acclaimed dive venues. Indeed, dive excursions account for a significant portion of the island’s bustling tourism trade and dive operations can be found on practically ever pier, street corner, and hotel lobby in the central town of San Pedro which is only a short boat ride from any of the area’s 35 major dive sites which span the full perimeter of the 25 mile long island. The Belize District, the Old Capital and surrounding areas. Belize City is undoubtedly the country’s main commercial hub with its downtown area being the central location for hundreds of local businesses including the main branches of the five leading commercial banks. The narrow congested city streets are lined with a curious array of deteriorated old colonial structures in addition to newly constructed offices and supermarkets as well as a number of establishments that cater to the large number of travelers that disembark at the rapidly developing tourist village situated in the heart of the Fort George Tourism Zone. Indeed, thousands of tourists traverse the half mile stretch between the tourist village and the downtown area on a daily basis making this a prime commercial venue for a diversity of tourist related ventures ranging from gift shops and tour operators to restaurants and cyber cafes. The city is home to two of the country’s largest hotels as well as the widest range of entertainment facilities including several modern nightclubs, a popular casino, cinema, and the country’s only bowling alley. Particular progress has been made in infrastructural development over recent years with the construction of an attractive seafront promenade on the north side of the city, a state of the art performing arts center as well numerous museums and cultural centers. The Belize Zoo, the only zoo of its kind in Latin America and the Caribbean! As the only facility of its kind within the Latin American and Caribbean region, The Belize Zoo delicately combines all the fascination and appeal of a stereotypical zoo with a well monitored conservation effort which allows native wildlife to flourish within its unique natural habitat. The zoo is located 29 miles west of Belize City, a convenient 45 minute bus ride from the Fort Street Tourism Village cruise port, the only cruise port in Belize City, rendering it accessible to stop-over visitors who wish to sample the splendor of the pristine Belizean wilderness without venturing too far from the ship. Certainly, the zoo’s most attractive feature is its user friendly layout consisting of a variety of well constructed walkways, spacious viewing platforms, and interactive exhibits which allow visitors to get up close and personal with the animals behind the safety barriers of carefully re-created habitats. Each exhibit is intricately tailored to the specific species which it showcases by the use of all indigenous shrubs and trees as well as the inclusion of well landscaped ponds and wetlands. The over 45 species of mammals, birds, and reptiles include the country’s most revered national symbols particularly the colorful keel-billed toucan, the majestic tapir or “mountain cow”, and rare black orchid in addition to the towering jabiru stork, elusive black jaguar, and playful howler monkeys. After a leisurely stroll around the winding walkways of the 29 acre compound visitors may purchase a souvenir at the fully stocked gift shop, enjoy a picnic lunch in the spacious picnic and playground area adjacent to the parking lot or opt to enjoy a hearty Belizean meal at any one of the superb roadside restaurants situated within close proximity to the zoo. As the only facility of its kind within the Latin American and Caribbean region, The Belize Zoo delicately combines all the fascination and appeal of a stereotypical zoo with a well monitored conservation effort which allows native wildlife to flourish within its unique natural habitat. The zoo is located 29 miles west of Belize City, a convenient 45 minute bus ride from the Fort Street Tourism Village cruise port, the only cruise port in Belize City, rendering it accessible to stop-over visitors who wish to sample the splendor of the pristine Belizean wilderness without venturing too far from the ship. San Pedro Ambergris Caye, More than sandy beaches, resorts and restaurants. Home to Belize’s premier vacation haven, the island of Ambergris Caye is situated 58km NE of Belize City and a mere ¼ mile from the largest barrier reef in the Western Hemisphere. The caye itself is 25 miles long and up to a mile wide in some areas. San Pedro Town, the central populous and bustling resort metropolis is located on the southern portion of the island. On first glance, San Pedro would appear to resemble a typical commercialized vacation hub; however, upon further inspection it is soon realized that the town is teeming with history and tradition which is clearly rooted in the cultural diversity of its people. Although the modern day economy predominantly thrives on the prosperous tourism trade, this was not always the case. In fact, tourism is still relatively new to the island and its growth is a key component of a rich heritage marked by continuous progress and the integration of many ideas and cultures. Cayo District is the largest and most populated district, inhabited by a variety of cultural groups, and situated amidst a backdrop of picturesque rolling hills, winding rivers and rich Mayan heritage. The chief residential and commercial areas are located within the capital city of Belmopan and scenic twin towns of Santa Elena and San Ignacio while smaller communities can be found in a large number of rural villages as well as the sleepy border town of Benque Viejo. From shallow sea-grass beds and lush mangrove clusters to rolling sea outside the protective reef crest, the diverse habitats of offshore Belize provide an affluent breeding ground for a countless variety of tropical game fish. It is thus understandable that both sport fishing and leisurely catch and release activities are fast competing with dive and snorkel operations as a popular aquatic recreational activity. In fact, most dive and tour operators also provide a number of fishing charters to some of the country’s most popular venues including the northern mangrove flats and the open sea to the east of the majestic barrier reef while also providing expeditions to the renowned atolls of Turneffe, Lighthouse, and Glover’s Reef.